As mentioned earlier, not only will the liver receive cholesterol and some fat from chylomicrons, but it is also a primary cholesterol- and triglyceride-producing organ in the body. Fat and cholesterol in excess of the liver's needs are packaged up into VLDLs and released into our circulation. As VLDLs circulate throughout our body, they unload a lot of their fat, mostly in fat cells. 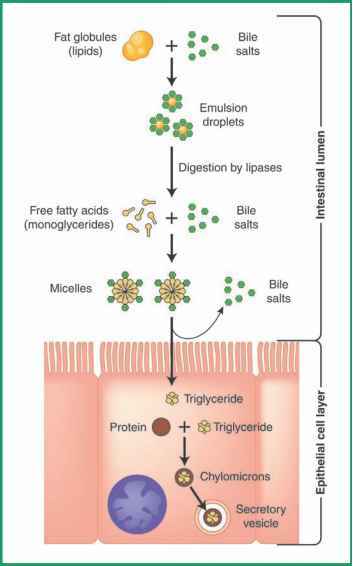 As a result their lipid to protein ratio decreases, which renders them denser, and they become LDLs (Figure 5.10). Therefore, LDL is derived from circulating VLDL. LDL has two fates. One fate is to continue to circulate throughout the body and deposit cholesterol in various tissues. The second fate is to be recognized by tissue, removed from the blood, and broken down. Many tissues throughout our body can do this, but the liver handles more than half of the task. The longer LDLs circulate, the more opportunity there is for cholesterol to be deposited throughout our body. 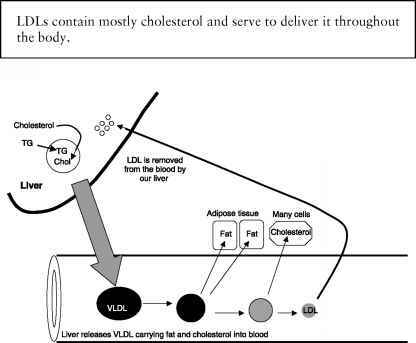 Figure 5.10 Very low density lipoproteins (VLDLs) release their fat to tissue (mostly adipose tissue) yielding low density lipoproteins (LDLs), which continue to circulate and to deliver cholesterol to tissue. LDLs are then removed from blood mostly by the liver.